Hey Divas! 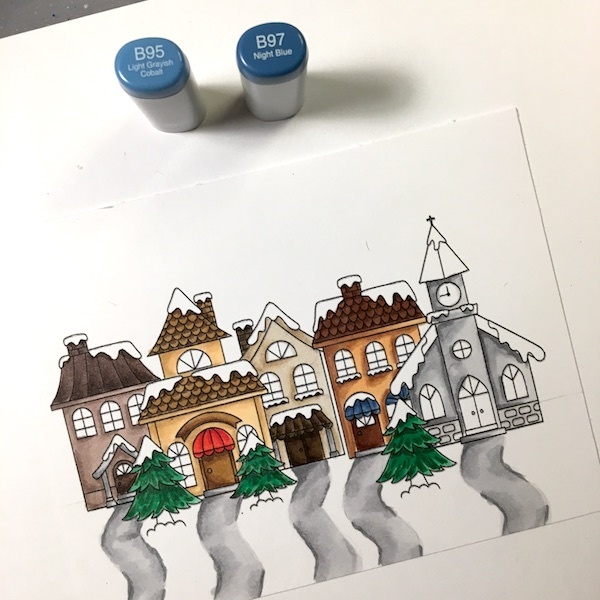 It is EK from ekgorman designs back again to share another copic colored card. 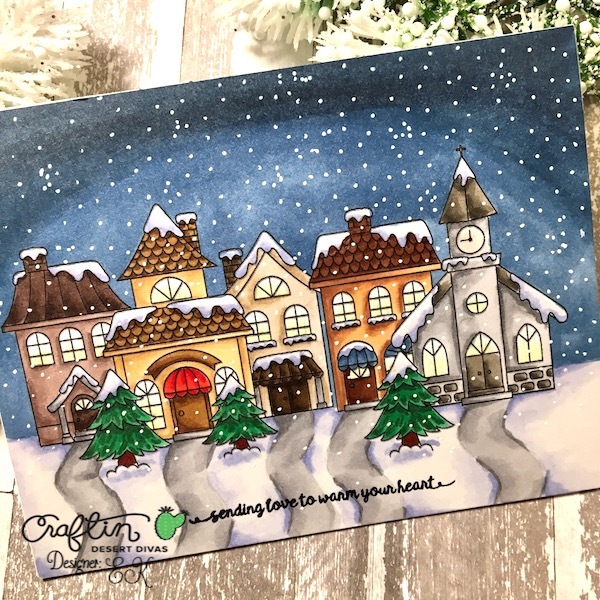 I hope you have been enjoying "Snow Week" here on the CDD blog. 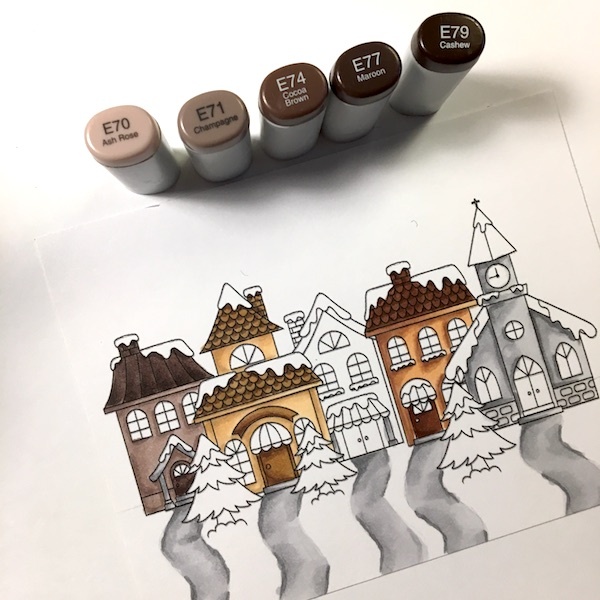 I am here to share with you a pictorial tutorial of how I would color with my copics a winter 'snow' scene. 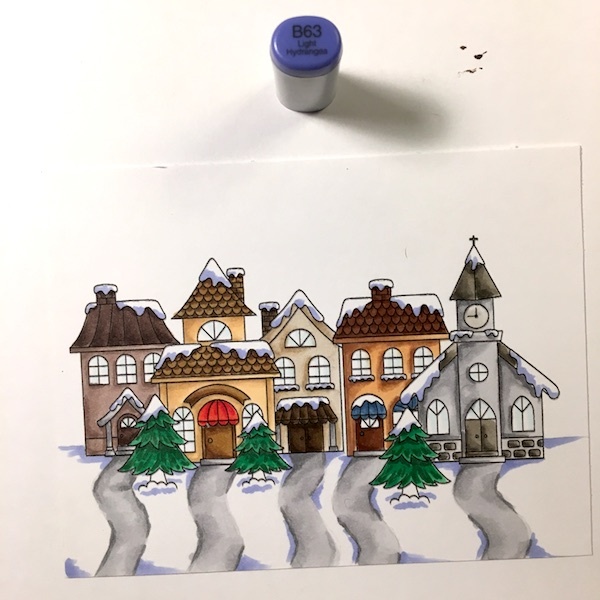 Ironically, while I colored in this card, outside my window the first snow fall of the season was happening. 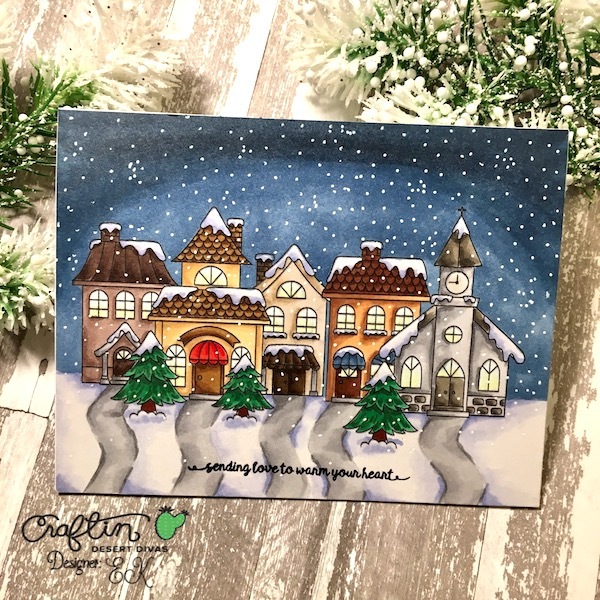 It only seemed fitting to be creating this card as I watched the snow fall. I took this picture to help inspire my coloring. 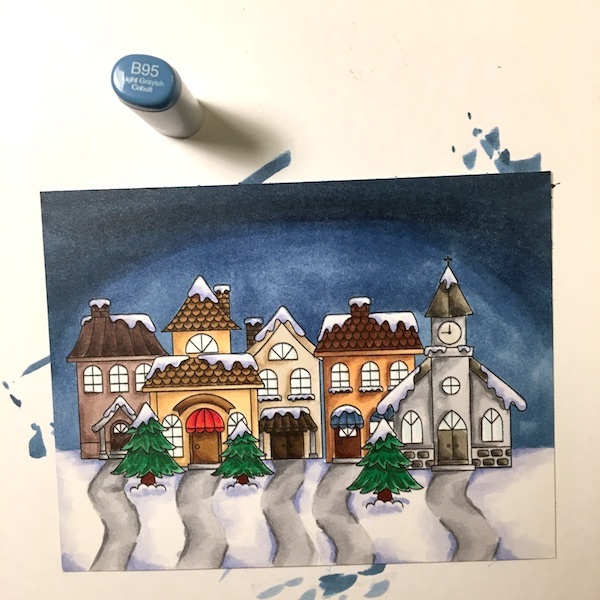 For this card I used CDD's new digital stamp set Winter Village to create this hometown scene. 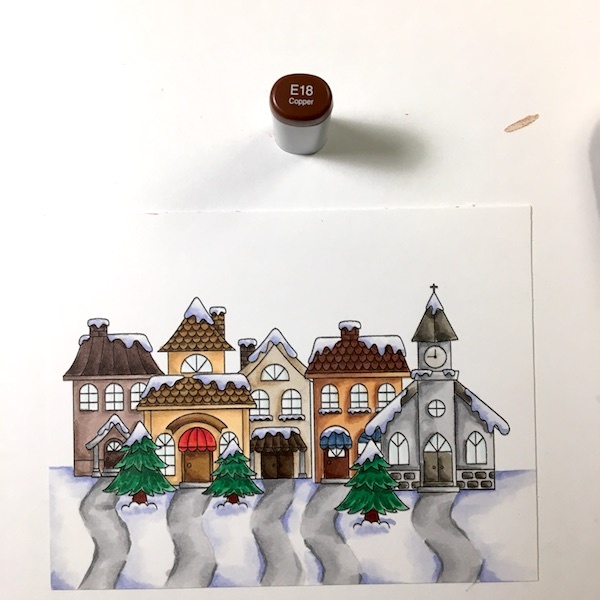 I created the scene making sure to layer the houses on top of each other so it looks realistic. I printed out the scene in landscape and let the printer ink set. 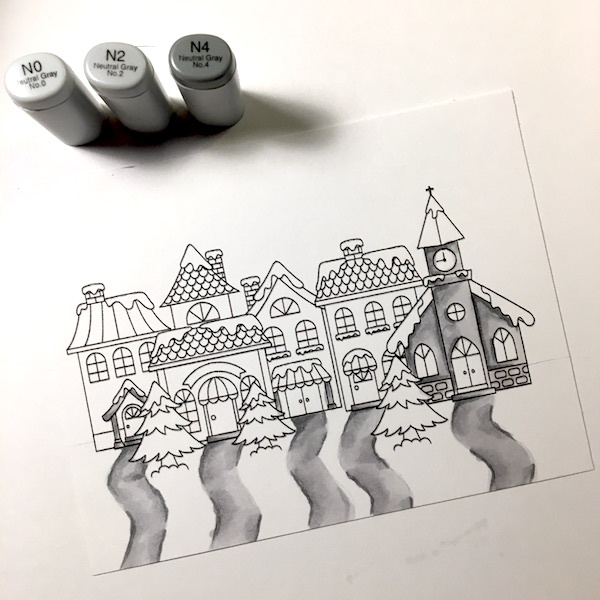 Using a pencil I quickly drew in the sidewalks from the buildings and set the horizon line. 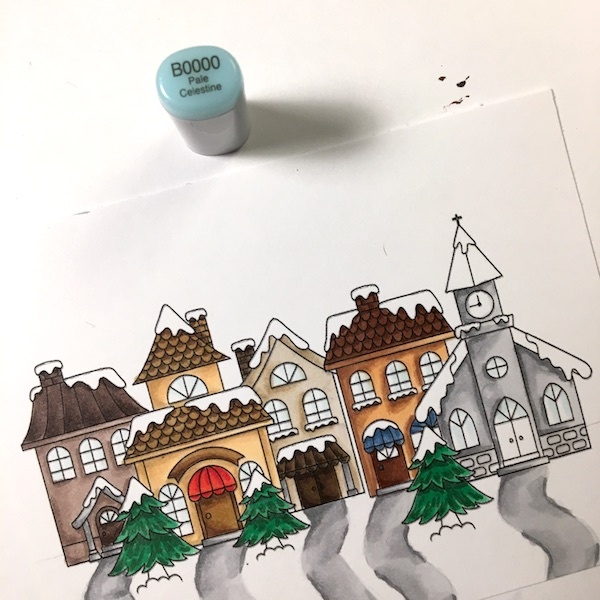 Using my neutral grey copics (N0, N2, and N4) I colored in the side walks and the church. 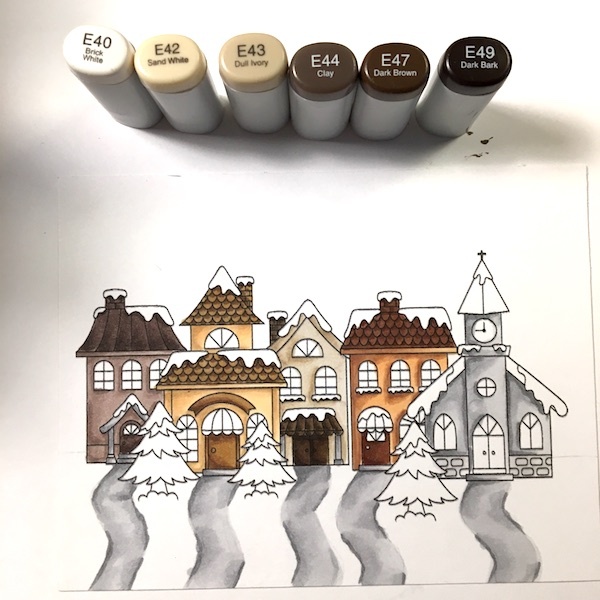 I decided from the beginning to color the buildings in with all brown tones, but with different collections. The first house I colored in with E21, E23, and E25 for the main walls. 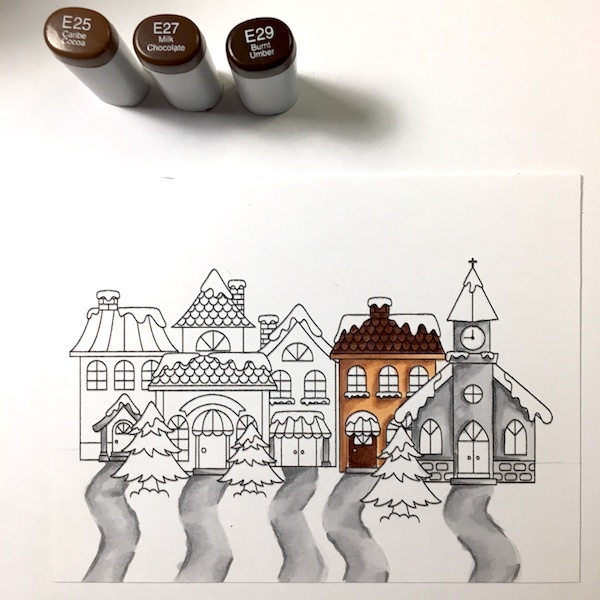 The roof and door were colored in with the darker tones from the the same brown collection. In this case I used E25, E27, and E29. 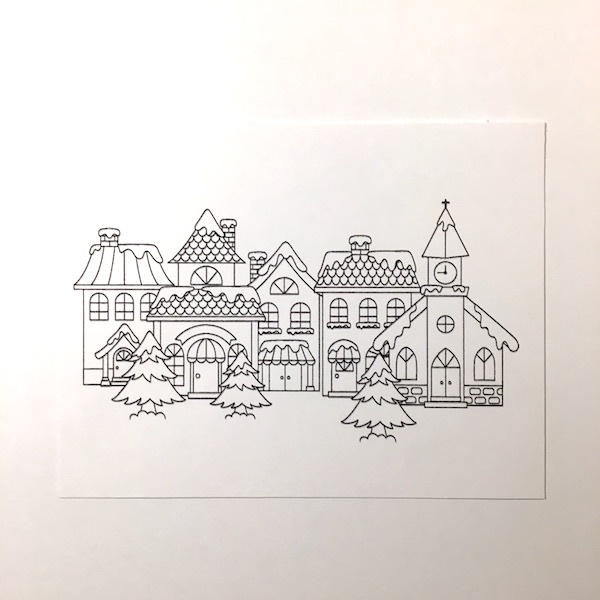 I followed this light wall/dark roof pattern for the rest of the houses. The second house walls were colored in with E51, E53, and E55. The roof, door, and above door ornament was colored in with E55, E57, and E59. The third house walls were colored with E70, E71, and E74. The roof and door were colored with E74, E77, and E79. 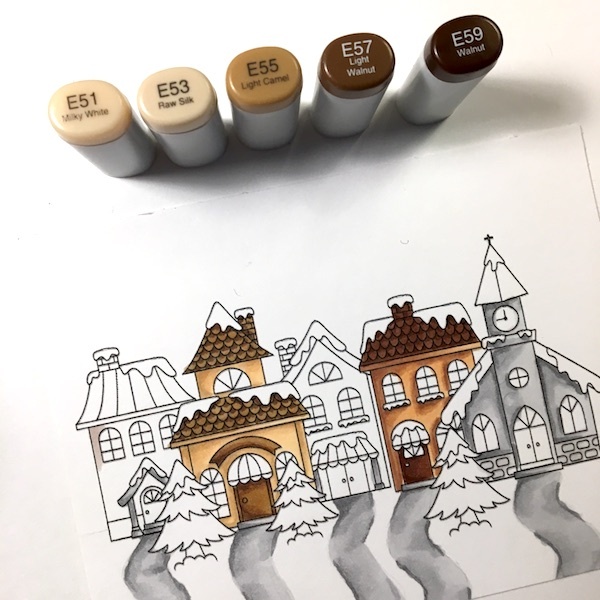 The final house was colored with E40, E42, and E43. The chimney, door and awning was colored in with E44, E47, and E49. 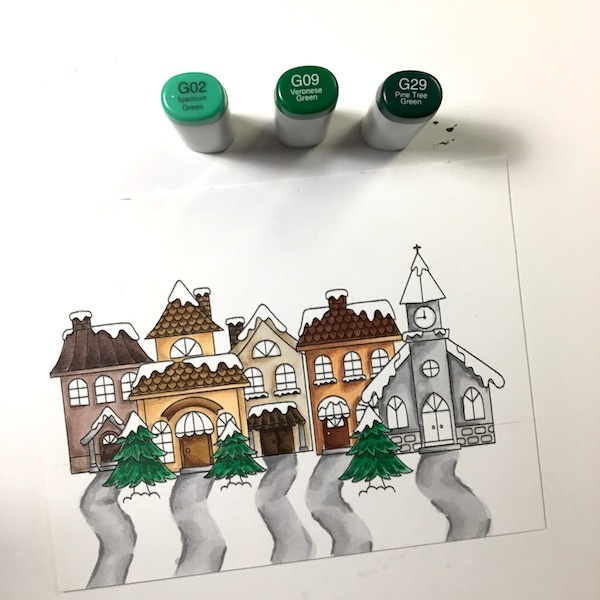 The trees were colored in with a combination of greens using G02, G09, and G29. To give a bit of festiveness to the scene, I colored one of the awning with R17 and R29. The second set of awnings were colored in with B95 and B97. The windows were all splashed with a bit of B0000. You will see later that I give the windows a second treatment because this color in the end wasn't enough. 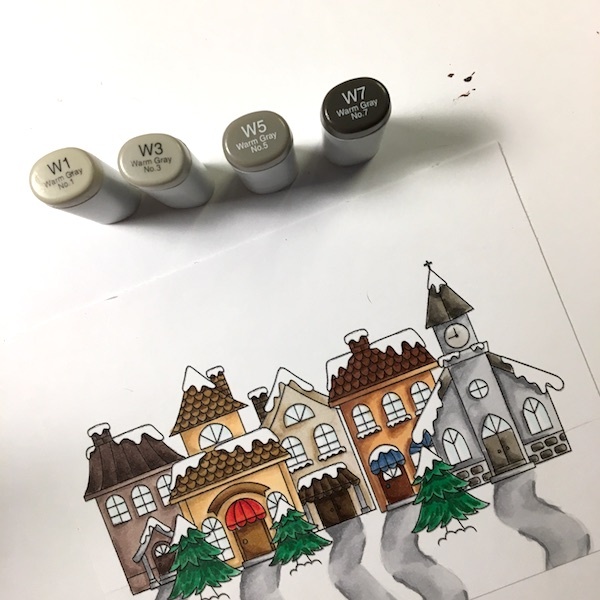 To finish off the basic coloring of the scene, I colored the church's roof, doors and brick with W1, W3, W5 and W7. My hands down favorite color combination for snow is not a grey collection but a blue collection. 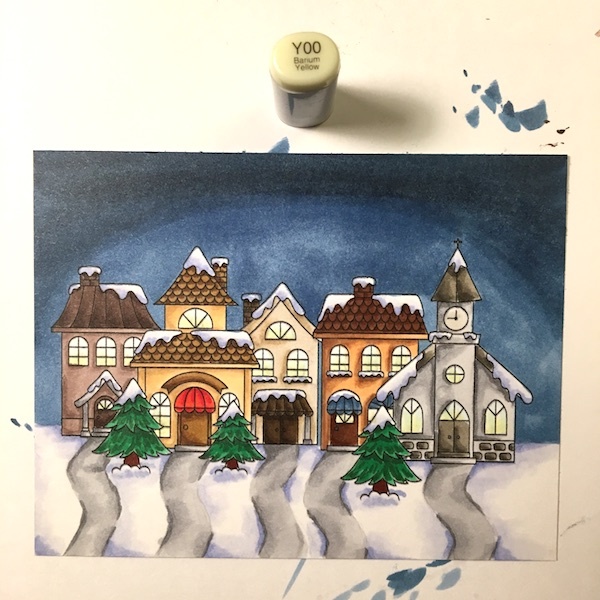 I find that coloring the snow in with B63, B60 and colorless blender, you get a realistic snow look. 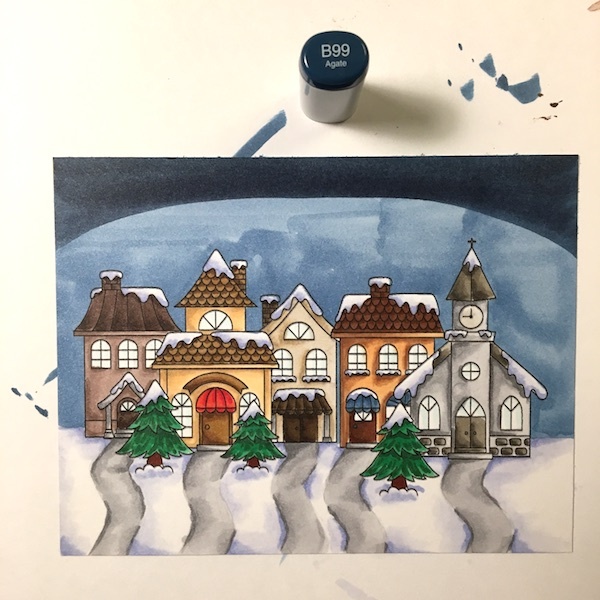 I don't normally start with the dark color, but when it comes to snow I always start with the dark and then got lighter blending out the dark edges. I layered the B63 in all the low or shadowed spots. I blended out the B63 with the B60 filling in the snow not completely, but a significant portion. Finally I used my colorless blender to went over all the blue tones I had laid down. I will tell you when you use colorless blender as heavily as I had here you don't see the final effects for several minutes. This picture here does not fully show the transformation that happened in the snow. The final pics of the card really show how well the colorless blender effects the blue tones. At this point I realized I had forgotten to color in the tree trunks, so I pulled out a E18 marker and colored the trunks in. 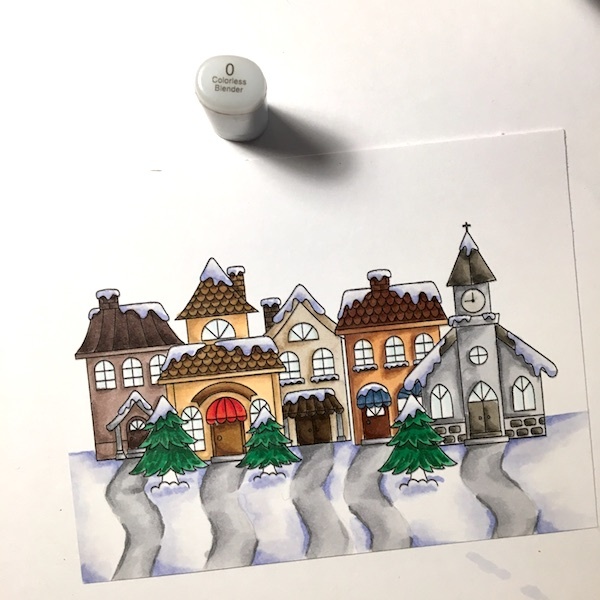 Originally, when I started this card it was going to be a day scene, but as I got to this place, the card just screamed to be a snow night scene. So I pulled out some night colored markers and started coloring. I laid down the first layer of night sky using my B95 marker. Then using my darkest blue marker, B99, I laid down the top horizon of the (moonless) night sky. I laid down the second darkest blue, B97, and followed a similar line as the B99 marker. Finally to finish off the night sky, I used the B95 marker to settle the blend of the sky. At this point I realized the B0000 I had originally put in the windows would not work. 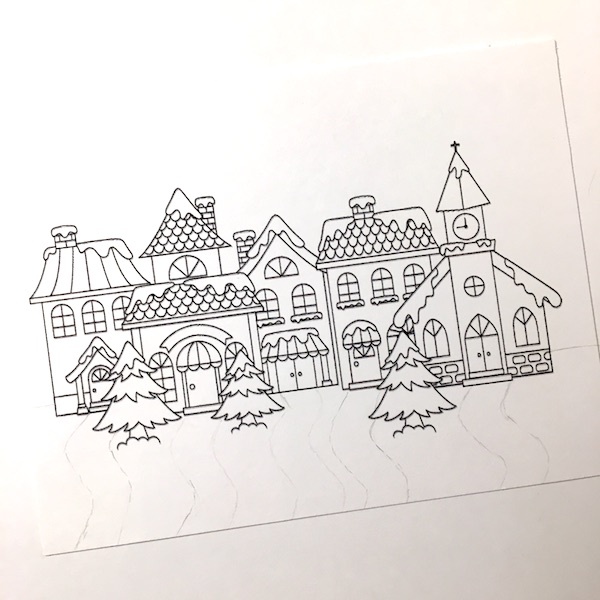 So using a Y00 marker I gave all the windows a haze of light. I got a new white gel pen for this card. 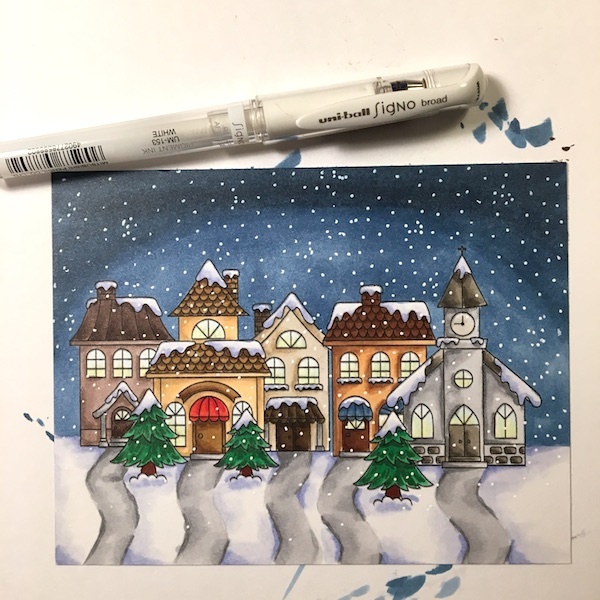 I picked up the Uni-ball white gel pen to create snow flakes falling from the sky. I will admit that this pen worked really well, and kind of wish I had tried it long before now! The key to creating a fun snowfall is to make sure you have some snowflakes really close together and don't forget to put snowflakes on top of your focal image! 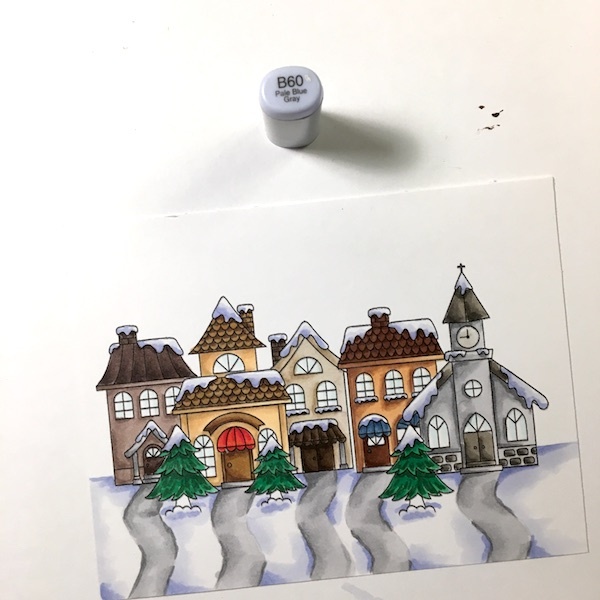 You can also see here how nicely the snow on the ground and houses have blended out here! 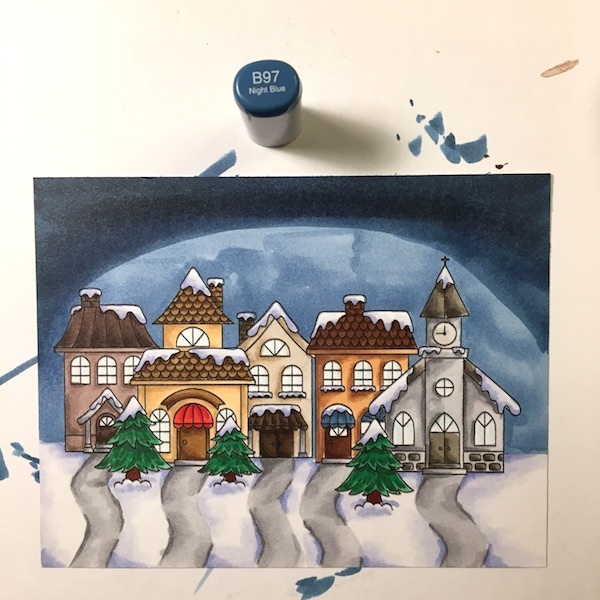 To finish the card I pulled out my Snow Days stamp set and used one of its sentiments, one I think works perfectly for this winter scene, and stamped it in some Versa Fine Ink. And here is the final card after letting all the markers settle for a while. 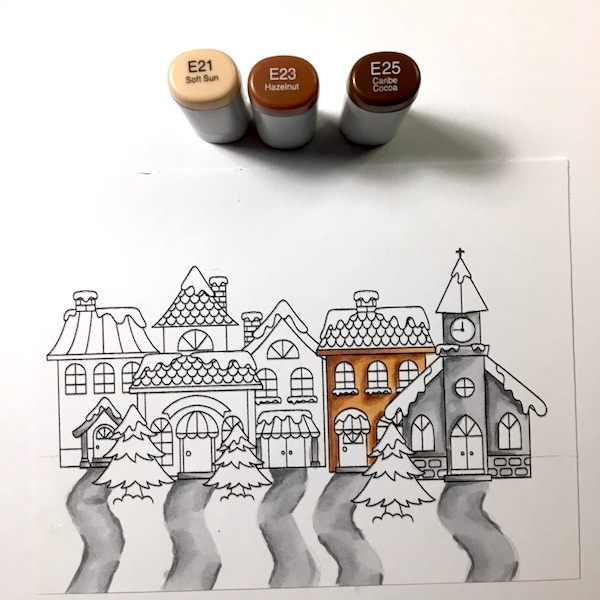 If you didn't know this, but copics need time to really dry. Minutes are not enough. 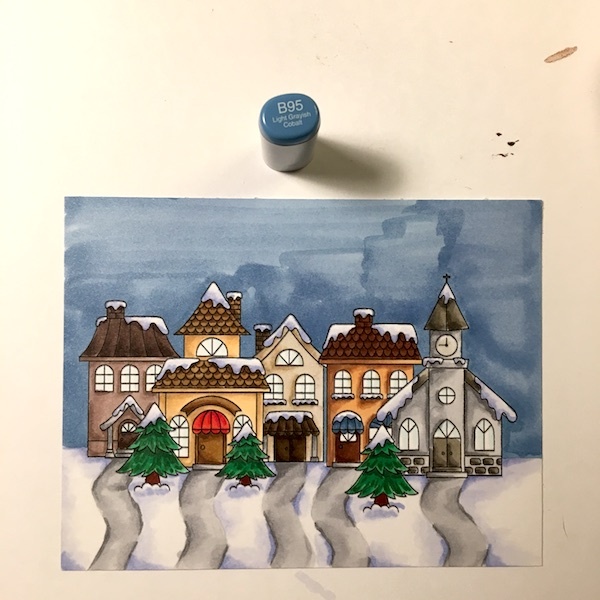 I try to always allow an hour between finishing coloring and taking a final picture because the paper really needs that amount of time to settle. 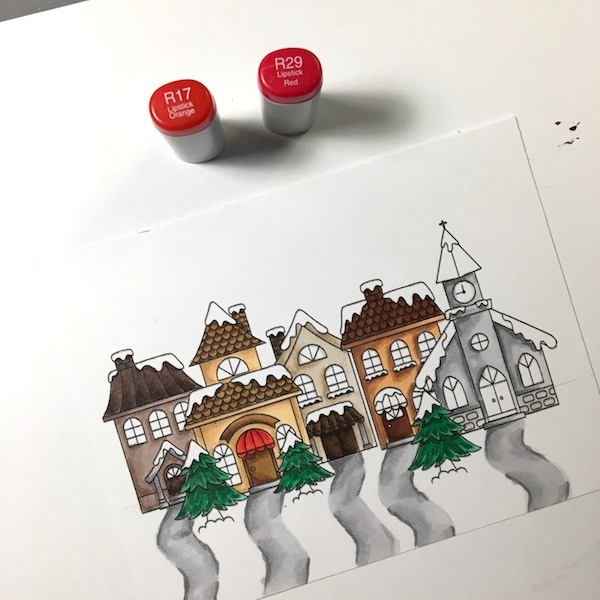 Make sure if you use any of these techniques that you share your work on the CDD Facebook Gallery. I would really love to see your work! Wow, EK!!!! Beautiful coloring, as always...will definitely try this!! !